Fiber is vital to the normal function of the digestive system in rabbits. Traditionally, rabbits have been fed a pelleted diet, supplemented with occasional fresh vegetables and hay. It now appears that this is not ideal in the long term, and can result in obesity and increase the likelihood of digestive problems. While there is some fiber in pellets, it is finely ground and does not appear to stimulate intestinal function as well as fiber found in grass hays. Roughage also aids in the prevention of hair balls. While pellets provide balance in the diet, it appears that fresh grass hay and vegetables should make up the bulk of rabbit diets. Anything other than hay, vegetables, and pellets is considered a treat and should be feed in strict moderation. The digestive system of a rabbit is very susceptible to serious upsets if the diet is inappropriate. The amount of pellets should be restricted, especially in overweight rabbits, but any reduction in pellets should be made up with a variety of fresh vegetables and unlimited access to hay. Hay (grass hays such as timothy or oat hay) should be available at all times. Some rabbits may not take much hay at first. Adding fresh hay a couple of times a day may help, and as the amount of pellets is reduced the rabbit will likely become hungry enough to eat the hay. The House Rabbit Society recommends starting baby bunnies on alfalfa hay and introducing grass hays by 6-7 months, gradually decreasing the alfalfa until the rabbit is solely on grass hays by 1 year. Alfalfa hay is higher in calcium and protein and lower fiber than the grass hays, although many owners find their rabbits prefer alfalfa hays. If your adult rabbit is used to alfalfa hay, try mixing alfalfa with a grass hay to start and gradually reduce the amount of alfalfa. Vegetable should make up a large portion of the diet. Depending on the size of the rabbit, 2-4 cups of fresh veggies should be given per day. A variety must be fed daily to ensure a balanced diet. If a rabbit is used to eating mainly pellets, the change must be made gradually to allow the rabbit's digestive system time to adjust. Only add one new vegetable to the diet at a time so if the rabbit has diarrhea or other problems it will be possible to tell which vegetable is the culprit. Suggested vegetable include carrots, carrot tops, parsley, broccoli, collard greens, mustard greens, dandelion leaves, turnip greens, endive, romaine lettuce, kale and spinach. However, kale, spinach and mustard greens are high in oxalates so their feeding should be limited to 3 meals per week. Beans, cauliflower, cabbage, and potatoes may cause problems and should probably be avoided. Iceberg lettuce has almost no nutritional value so should be avoided. Rhubarb should also be avoided (toxicity). Wash vegetables well, and only feed dandelions that are known to be pesticide free (try a health food store for organically grown dandelion greens). Vegetables should be introduced to bunnies around 12 weeks of age, in small quantities and one at a time. As more vegetable are added watch for diarrhea and discontinue the most recently added vegetable if this occurs. Over time, the amount of vegetables fed is increased, and the amount of pellets decreased, so that by 1 year of age the adult feeding recommendations are followed. Pellets are basically designed for commercial rabbit production, and are quite high in calories. As a result, house rabbits fed unlimited pellets may end up with obesity and related health problems, as well as an excess of other nutrients. That is not to say that pellets do not have their place in rabbit nutrition, as they are rich and balanced in nutrients. However, experts recommend restricting the amoung of pellets fed, and compensating with fresh vegetables (see below) and grass hays. Choose a fresh, good quality pellet. The House Rabbit Society recommends a minimum of 20-25% fiber, around 14% protein (with no animal protein), and less than 1% Calcium for most house rabbits (spayed/neutered). For adults, the amount should be carefully regulated, depending on the size (weight) of the rabbit. As a rule, give about 1/4 cup for rabbits 5-7 lb, 1/2 cup for 8-10 lb rabbits, and 3/4 cup for 11-15b lb rabbits. 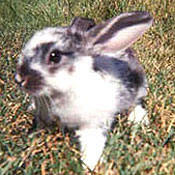 Baby rabbits can be fed pellets free choice (available at all times), decreasing to 1/2 cup per 6 lb. of body weight by around 6 months. The House Rabbit Society recommends 1-2 tablespoons of fresh fruits be given daily as a treat. Treats sold in pet stores marketed for rabbits are generally unnecessary and in some cases could cause digestive problems due to their high carbohydrate or sugar content. Instead of food treats, consider offering twigs from apple or willow trees pesticide-free).